Safer and more effective than cotton swabs, this cordless ear vacuum has being designed with you in mind. It can be extremely frustrating when your ears become blocked with excessive wax and can cause you countless problems. What makes this particular ear vacuum so great? The compact but powerful ear vac removes moisture gently giving you fast results, hygienically. You can indulge in the simplicity in the operation of this device as there is just one on/off switch. The ear vac also comes with 4 colourful, soft hygienic tips to allow multiple users to enjoy the benefit of this powerful ear vac. Included in the pack you will also receive a bonus cleaning brush. Did you know that earwax is produced in the sebaceous glands within the ear? Its purpose is to clean, protect and lubricate the lining of the ear by trapping dirt and repelling water. Earwax only begins to cause problems when there is too much of it being produced and it can subsequently cause blocked, painful ears or temporary impaired hearing. If you suffer from repeated ear infections, flaky skin or excess hair within your ear canals you can be at risk of developing excess earwax. You can help to reduce the possibility of developing earwax problems by refraining from putting certain objects in the ear such as cotton buds and bobby pins because these items can potentially make the earwax lodge deeper within your ear. 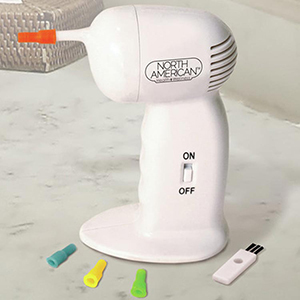 The cordless ear vac is carefully designed to safely assist in the removal of earwax. It’s gentle and powerful helping you to prevent and remove any excess earwax.